A whole host of celebrities are giving the thumbs up in support of the Sign Good Morning campaign organised by the Life and Deaf Association. Daniel Radcliffe, Sir Ian McKlellen and Boris Johnson are amongst the many famous people who are backing the campaign. 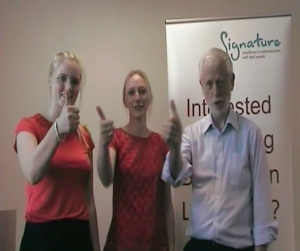 Signature is proud to join the celebrities in wishing 125,000 British Sign Language users "Good Morning".